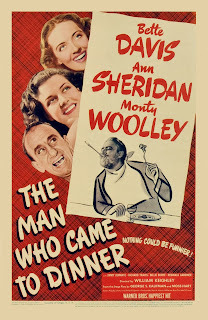 If you like old movies - hell, if you like comedies in general - this is worth tracking down. The less you know going in, the more fun you'll have with each twist and turn. And if you find most classic Christmas films hard to get through due to their moralizing... well, then you can take that recommendation at double-strength. Because this movie has more in common with Dirty Rotten Scoundrels than It's a Wonderful Life. Perhaps Bad Santa comes closest in the Christmas canon, but... no. Bad Santa is far more sentimental and ethically driven than The Man Who Came to Dinner. The story centers around Sheridan Whiteside, a famous radio host. While on tour, he slips on a patch of ice in front of a wealthy midwestern family's house and winds up confined to their couch while he recovers. He's accompanied by his assistant, Maggie, who falls in love with Bert, a local newspaper editor/aspiring playwright. When Maggie informs Whiteside she intends to marry Bert, the eccentric radio host calls in Lorraine, a famous actress, in the hopes she'll steal Bert away. Maggie and Whiteside then play a complex game of manipulation in an attempt to achieve their own ends. Maggie enlists a visiting actor to fake a call from a rich man Lorraine is trying to marry for money. This almost works, but Lorraine catches on and realizes Maggie was behind the ruse. In retaliation, she escalates her efforts to ensure Bert will come away with her after Christmas. Realizing he's gone too far, Whiteside calls in Banjo, yet another actor, to undo some of the damage he's caused. But by then it may be too late: while all of this has been going on, Whiteside has also managed to infuriate the house's owner by convincing his daughter to run off with a union organizer and his son to become a photographer and travel the world. This is in addition to taking over the man's house and threatening a lawsuit over the accident. When he's finally had enough, the homeowner gets a warrant from the police demanding Whiteside leave, giving him just fifteen minutes to figure everything out. Just when it seems like all hope is lost, Whiteside places the face of the homeowner's enigmatic sister who's been popping in occasionally to interact with the radio host. The whole time, he's mused that she looks familiar, suggesting they might have some shared history or connection. And if this were a normal movie, that's probably where the story would have gone. Instead, he realizes she is a former ax-murderer who killed and chopped up her parents as a child. He obtains the homeowner's assistance - as well as his promise to let his children live their own lives - by blackmailing him with this information. Whiteside and Banjo succeed in removing Lorraine from the house by trapping her in an Egyptian sarcophagus and loading her on a plane, thus giving Maggie a chance with Bert. With everything resolved happily (or at least happily enough) for most of the characters, Whiteside (having long since secretly recovered) heads out the door to leave Ohio and never return. He promptly slips on the same icy step, injures himself again, and is carried back in the house shouting threats to sue the homeowner for twice as much as before. The movie is almost entirely set in a single location, so it's not surprising it was based on a play from a few years earlier. Also unsurprising is the discover the main characters were inspired by famous personalities the playwrights, George S. Kaufman and Moss Hart, were friends with. You spend the movie feeling as though there are countless references and inside jokes you're not quite getting. But even without this context, the absurd characters and situations still work. I mentioned the movie's biggest flaws at the start. While the vast majority of the movie's satire is at the expense of wealthy industrialists or Hollywood stars, it occasionally strays from these targets and makes a joke that aged badly. The most egregious of these scenes involved a group of Chinese dignitaries that gets racist quickly. In addition, the antics of Banjo cross quite a few lines when women are involved. Whiteside isn't much better, though he favors verbal abuse as opposed to sexual harassment. That said, the resolution with Whiteside's nurse (a minor character he torments the entire movie) is brilliant. In a dark twist, she tells him what she thinks of him, and her arc captures the movie's dark spirit perfectly. Her victory is just and her resolution is logical, but taken out of context it's a hilariously cynical moment (albeit a little troubling given one word choice that wouldn't age well over the following decade). Arguably, the movie's structure could count as another flaw. The script has a proclivity for introducing and dropping characters haphazardly, making an already convoluted plot even harder to follow. This didn't bother me, though - I liked the sense of vertigo this elicits. It feels like anything could happen, normal rules of writing be damned. From the start, this movie experiments with how far it can push the bounds of decency without going over the line, and the places where it falters most are those where the line has moved. If you can go in accepting that, there's a great deal to enjoy here, particularly as a Christmas movie. This plays with the absurdity of the holidays in a culture as greedy and self-obsessed as ours. The scene where Whiteside gets ready to broadcast his Christmas Eve show while the side effects of his machinations wreak havoc illustrates this brilliantly. And while I think Lorraine's treatment may have crossed a few lines (she wasn't the best person, but some of what was done to her was pretty cruel), I appreciate that the worst trick played on her was orchestrated by Maggie, an otherwise good person who allowed her desires and sense of righteousness to override her sense of right and wrong. It's a refreshing change to see the "nice girl" do something devious and horrible. She's a complex, intelligent person - the only character in the movie who comes close to being Whiteside's equal. You don't see women given roles like this often in the era this was made. On top of everything else, the cast is fantastic. 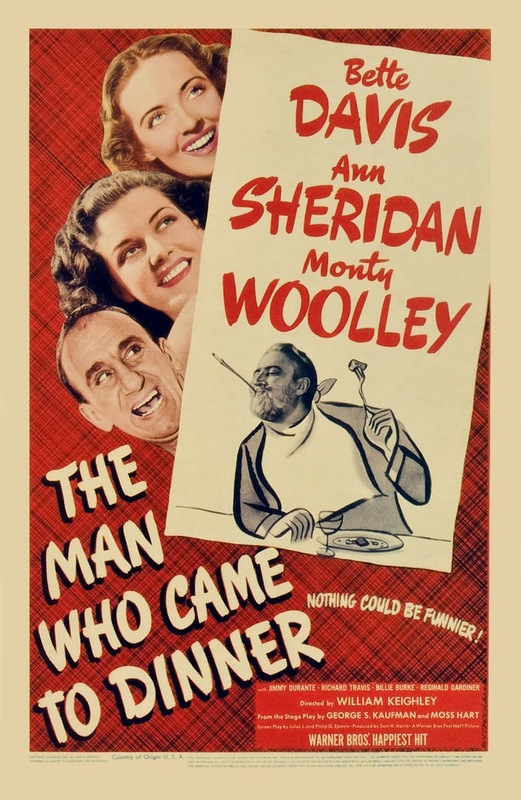 Monty Woolley's Whiteside is without a doubt the star, but Bette Davis (who'd later star in Pocketful of Miracles) does great work here as Maggie, Jimmy Durante (The Great Rupert and the narrator on Frosty) is fun as Banjo, and Billie Burke (a.k.a. : Glinda from Wizard of Oz) is hilarious in a bit role. You can safely include this on the list of underappreciated Christmas comedies. It's a lot of fun, and I highly recommend it to anyone looking for something ramping up the satire and dialing back the sanctimony you normally get with holiday entertainment.